Why a post about "massage" right after Tisha B'av? Read on and see. There are two opinions as to the etymology of massage. One opinion (quoted by Klein as well as others) is that it comes to English from French, via the Arabic massa, meaning "he felt, touched". This Arabic word is related to the Hebrew משש, also meaning "to touch". Some derivatives of this root are mishosha משושה - antenna (of an insect) and the verb למשמש - also meaning "to touch or feel". However, another opinion claims that the Arabic root is masaha - "to stroke, anoint, rub". 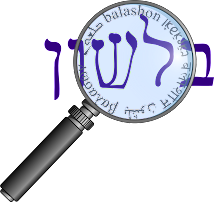 This root is cognate to the Hebrew משח, the root of the Hebrew word mashiach משיח - and the English Messiah (and the connection to Tisha B'av as well, for legend says that the Mashiach (Moshiach) will be born on Tisha B'Av). There is a similar sense development in Indo-European languages as well, for the words "cream" and "christ" are also connected (see here, about the middle of the page). משה - to pull, to draw (from water, hence the name Moshe), according to some opinions the word for silk meshi משי - also comes from this root, for the worms pull the threads through their bodies. משק - to direct, to lead (originally "to pull"), from here the word meshek משק - economy. Steinberg claims that the original name of Damasek דמשק (Damascus) was Darmesek (as appears in Divrei HaYamim). He gives the etymology of Darmesek as דר-משק "dar meshek" - a place of commerce. מוש - to remove, to pass. Steinberg derives the word for "last night, the night that passed" אמש - emesh, from this root as well.